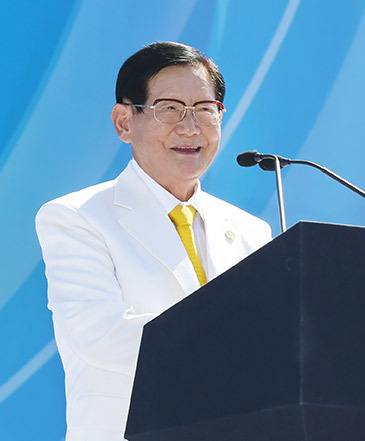 I am Man Hee Lee, Chairman of Heavenly Culture, World Peace, Restoration of Light (HWPL). I would like to take this opportunity to extend my deepest gratitude to all people who work for world peace and cessation of war in collaboration with HWPL. Undoubtedly, the endorsement at the national level and the participation and support of civil societies helped to produce these results. However, they would not have been possible without the cooperation and dedication of peace messengers who are working for peace understanding the importance of it. We are the messengers of peace born in this era with the mission to build a peaceful world and to leave it as a legacy to future generations. Let us fulfill this duty by putting in concerted efforts to submit the Declaration of Peace and Cessation of War (DPCW) in the form of a resolution to the UN, so that it can be implemented as international law to achieve true peace across the globe. Then, we will be able to leave a world of peace as a lasting legacy to our children. This is a shared goal of humanity and the way to realize sustainable peace that mankind has been hoping for. As spring full of warmth comes after a harsh winter, we are welcoming an era of peace after a time of conflicts and division. The refreshing and sweet scent of peace spread by HWPL and peace messengers is filling the air foretelling the coming of an everlasting spring. Let us take a leap forward for peace as one.